… where we put the “family” back into family entertainment! Laughter, wonder, and togetherness are just some of the ingredients to great memories, and you’ll make many of them with your family at the Beja Shrine Circus. Watch as our skilled performers demonstrate extraordinary strength and skill while defying gravity via trapeze, motorcycle, and aerial wire. Cheer loudly as stunning tigers roar their way into your hearts and colossal elephants create graceful pyramids. And in between? We’re just clownin’ around! Affordable. Fun. Unforgettable. 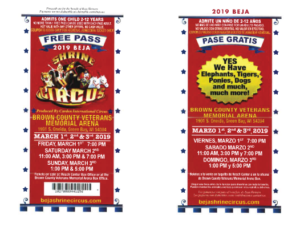 The Beja 2019 Shrine Circus. Come clown around with us!